Fog is a cloud that is on the surface. It typically occurs when the temperature of air near the ground is cooled to the air’s dew point. At this point, water vapor in the air condenses and becomes visible in the form of fog. Fog is classified according to the manner in which it forms and is dependent upon the current temperature and the amount of water vapor in the air. On clear nights, with relatively little to no wind present, radiation fog may develop. [Figure 12-21] Usually, it forms in low-lying areas like mountain valleys. This type of fog occurs when the ground cools rapidly due to terrestrial radiation, and the surrounding air temperature reaches its dew point. As the sun rises and the temperature increases, radiation fog lifts and eventually burns off. Any increase in wind also speeds the dissipation of radiation fog. If radiation fog is less than 20 feet thick, it is known as ground fog. 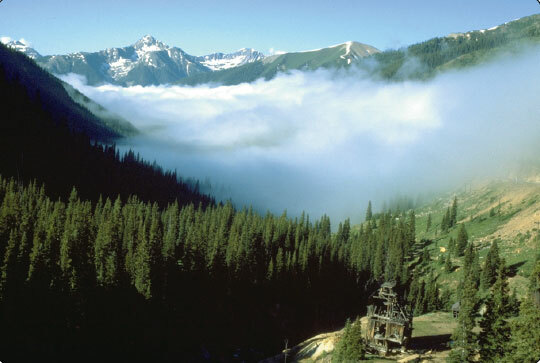 Upslope fog occurs when moist, stable air is forced up sloping land features like a mountain range. This type of fog also requires wind for formation and continued existence. Upslope and advection fog, unlike radiation fog, may not burn off with the morning sun but instead can persist for days. They can also extend to greater heights than radiation fog. Steam fog, or sea smoke, forms when cold, dry air moves over warm water. As the water evaporates, it rises and resembles smoke. This type of fog is common over bodies of water during the coldest times of the year. Low-level turbulence and icing are commonly associated with steam fog. Ice fog occurs in cold weather when the temperature is much below freezing and water vapor forms directly into ice crystals. Conditions favorable for its formation are the same as for radiation fog except for cold temperature, usually –25 °F or colder. It occurs mostly in the arctic regions but is not unknown in middle latitudes during the cold season. Precipitation refers to any type of water particles that form in the atmosphere and fall to the ground. It has a profound impact on flight safety. Depending on the form of precipitation, it can reduce visibility, create icing situations, and affect landing and takeoff performance of an aircraft. Precipitation occurs because water or ice particles in clouds grow in size until the atmosphere can no longer support them. 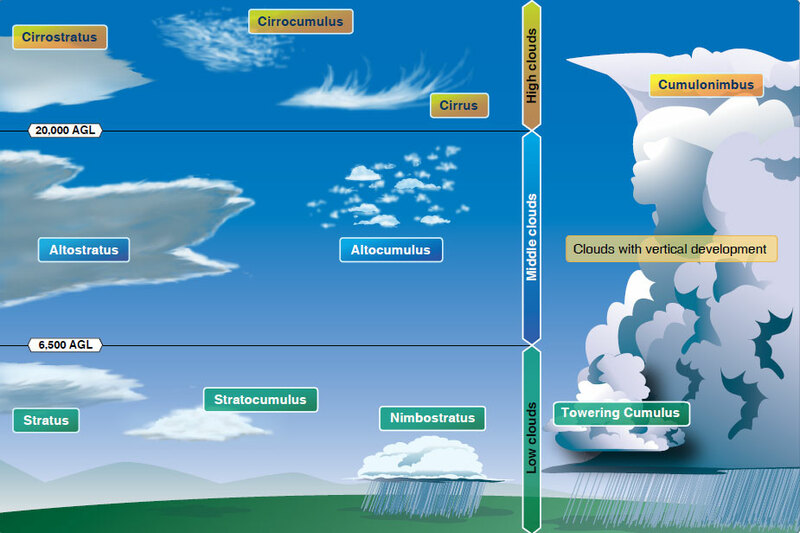 It can occur in several forms as it falls toward the Earth, including drizzle, rain, ice pellets, hail, snow, and ice. Drizzle is classified as very small water droplets, smaller than 0.02 inches in diameter. Drizzle usually accompanies fog or low stratus clouds. Water droplets of larger size are referred to as rain. Rain that falls through the atmosphere but evaporates prior to striking the ground is known as virga. Freezing rain and freezing drizzle occur when the temperature of the surface is below freezing; the rain freezes on contact with the cooler surface. If rain falls through a temperature inversion, it may freeze as it passes through the underlying cold air and fall to the ground in the form of ice pellets. Ice pellets are an indication of a temperature inversion and that freezing rain exists at a higher altitude. In the case of hail, freezing water droplets are carried up and down by drafts inside cumulonimbus clouds, growing larger in size as they come in contact with more moisture. Once the updrafts can no longer hold the freezing water, it falls to the Earth in the form of hail. Hail can be pea sized, or it can grow as large as five inches in diameter, larger than a softball. Snow is precipitation in the form of ice crystals that falls at a steady rate or in snow showers that begin, change in intensity, and end rapidly. Snow also varies in size, from very small grains to large flakes. Snow grains are the equivalent of drizzle in size.